1945 Born in Dublin, Ireland on 30 June. 1949-59 Family moves to London. Grows up in a working-class area of South London and attends local convent schools. Paintings in Catholic churches have an important influence on him. The nine-year-old schoolboy wants to become an artist. Becomes interested in American Rhythm & Blues music and starts a music club of his own. Retains his interest in popular music all his life. 1960-62 Apprentices at a commercial printing shop in London. Joins a graphic design studio. 1962-65 Attends evening classes at the Central School of Art, London with an interest in figurative painting. 1964 Regularly visits Vincent van Gogh’s painting Van Gogh’s Chair (1888) at Tate Gallery, London (Now in The National Gallery, London). Its directness has a profound effect on the young artist. 1965-1968 Decides to dedicate himself entirely to art studies. Studies at the Croydon College of Art, London. Is interested in van Gogh, Emil Nolde, Karl Schmidt-Rottluff and Henri Matisse. 1968-72 Attends Newcastle University, Newcastle-upon-Tyne, England. After graduation remains as teaching assistant. At the same time teaches Art one day a week at the City of Sunderland College of Art, Houghton-le-Spring, England. His technically flawless paintings consist of a complicated grid system of intersecting bands and lines, which form a rich optical field. 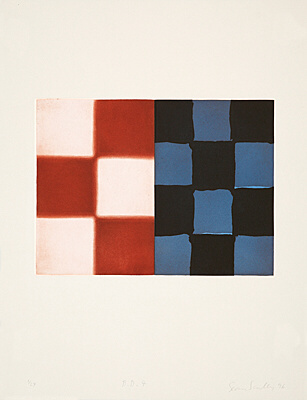 The illusion of depth and space is activated by color contrasts. The influence of Op Art is clearly visible. Visits Morocco in 1969. 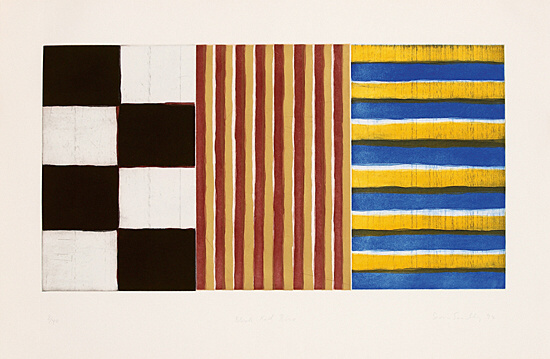 The stripes and colors of local textiles and carpets and the southern light make as deep an impression as they did on Eugene Delacroix, Matisse and Paul Klee. 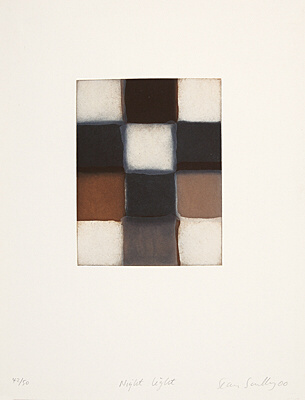 1970 Awarded the Peter Stuyvesant Foundation Prize. 1972-73 Awarded the Frank Knox Fellowship to attend Harvard University, Cambridge, MA. Makes his first visit to the United States. Experiments with new techniques; Starts using tape and spraying paint in paintings composed of grids of interlaced vertical, horizontal and diagonal bands and stripes. All expressiveness is omitted. 1973 First solo exhibition at the Rowan Gallery, London after returning from America. Sells out the entire show. 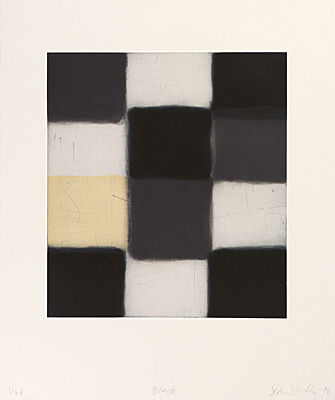 Inset #2 is a temporary break in his rigid grid system and prefigures his device of the inset canvas, which becomes a distinctive feature of his work from the beginning of the 1980s. 1973-75 Teaches at the Chelsea College of Art and Design and Goldsmith’s College of Art and Design, London. 1975 Awarded a two-year Harkness Fellowship with which he moves to New York. Lives with the artist Catherine Lee. 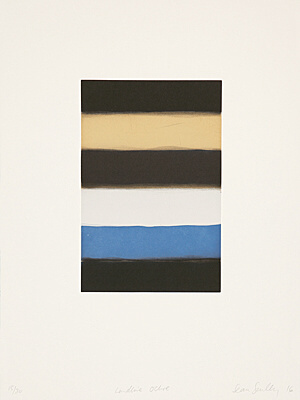 American art, especially Minimalism, and his friendship with Robert Ryman encourages him to simplify his expression. Creates Change series, 50 acrylic works on paper. This pivotal series reflects the changes in his personal life. 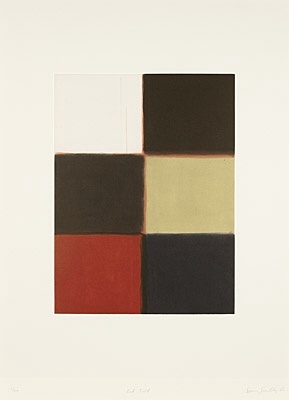 At the same time, it prefigures the large, spatially hermetic dark canvases of the following years. 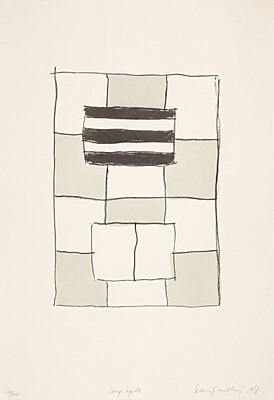 1977 Has his first solo exhibition in New York at the Duffy-Gibbs Gallery. 1978-82 Teaches part-time at Princeton University, New Jersey, USA. Develops important friendships and contacts in the academic and art world. 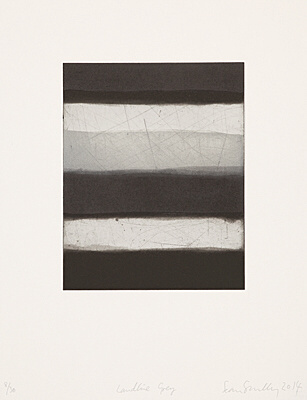 At this time, his palette is reduced to shades of grey monochrome “Black Paintings”. 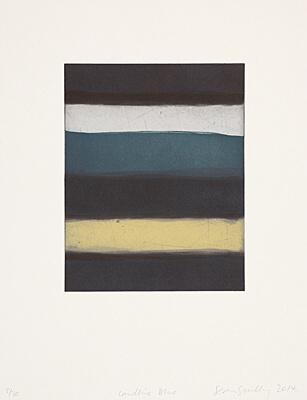 The composition is pared down to thin horizontal or vertical lines. 1979 Decides together with his wife to choose one his especially important or typical paintings every year to be named after her. This marks the beginning of his private collection, the series The Catherine Paintings. 1980 Travels to Mexico. Inspired by the trip, he begins painting from nature, transcribing his experience of color and light directly on the paper with watercolors. Before 1980 used watercolor only occasionally. 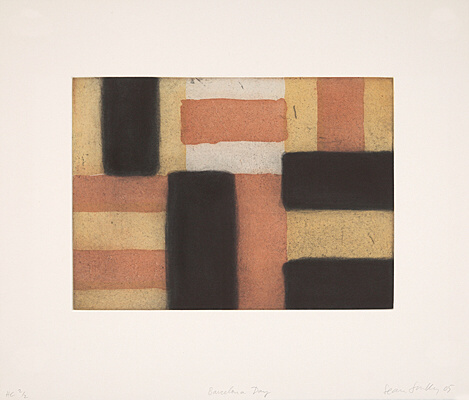 1981 First retrospective at the Ikon Gallery, Birmingham, England travels within the United Kingdom under the auspices of the Arts Council of Great Britain. Starts to withdraw from Minimalist aesthetics. Color and space return. Stops taping his stripes and starts drawing them freehand. Brushstrokes are clearly visible. A soft painterly outline becomes characteristic of his works. Gets his richness of color by overpainting in many different layers. The large polyptych Backs and Fronts, his manifesto painting is completed. 1981-84 Teaches at the Parsons School of Art, New York, USA. 1982 Spends part of the summer working at the artists’ colony founded by Edward Albee at Montauk, Long Island. Produces small multi-panel works on found pieces of wood. Reaches maturity with Heart of Darkness. Combines rigid geometry with expressive texture and color. 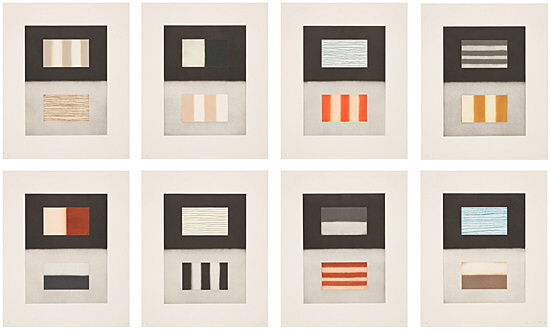 1982-83 Continues to combine and recombine canvases to make polyptychs. 1983 Becomes American citizen. Paul, his nineteen-year-old son from a previous marriage, dies in a car accident in London. Receives the National Endowment for the Arts Fellowship. Begins his first collaboration with a printer. 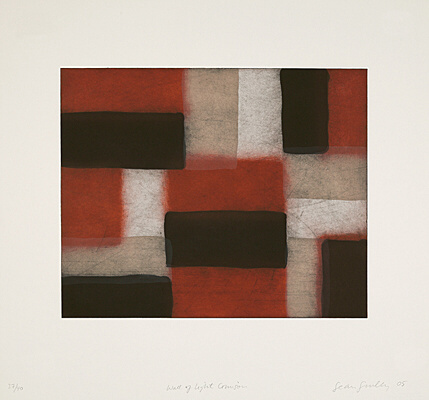 This prefigures his long-term commitment to printmaking using various graphic techniques. Dedicates his painting Paul to his deceased son. Selected for the exhibition entitled An International Survey of Recent Painting and Sculpture at the Museum of Modern Art, New York, NY. 1985 First solo American museum exhibition at the Museum of Art, Carnegie Institute, Pittsburgh, PA; travels to the Museum of Fine Arts, Boston, MA. Major museums acquire large-scale Modernist paintings by Scully at a time when Postmodernism is the dominant trend. The paintings become more physical, to the point where they can stand freely on the floor without any need for support, although they are conceived to hang on the wall. 1987 Changes to a less complex, flatter and smaller scale of working. 1987-90 Makes a number of visits to Mexico. 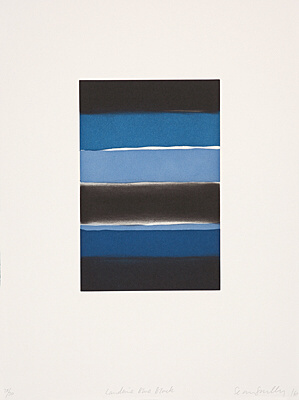 Exposure to new sources of visual stimuli can be seen in new watercolors and works on paper. Creates the first image that would become an extended meditation on architecture and light with the Wall of Light series. 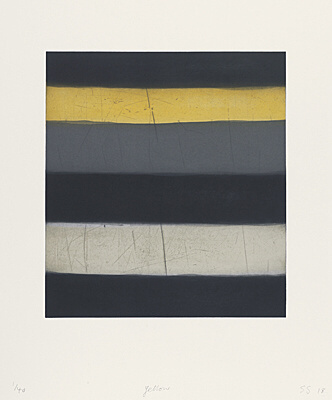 1988 Incorporates, for the first time, the element of steel in a painting, Why and What (Yellow). 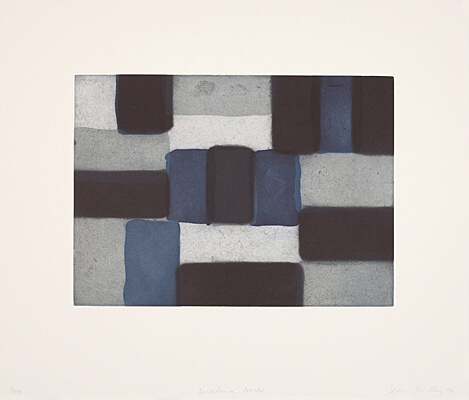 1989 First solo exhibition in a European museum, Whitechapel Art Gallery, London; travels to Palacio Velázquez, Madrid and Städtische Galerie im Lenbachhaus, Munich. 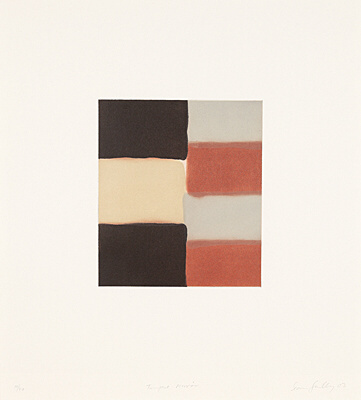 1990 Maurice Poirier’s monograph is published by Hudson Hills Press, New York. 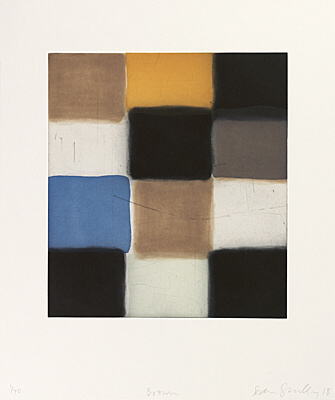 Photographs by Scully are published for the first time, in black and white as illustrations and in color in the paintings section. 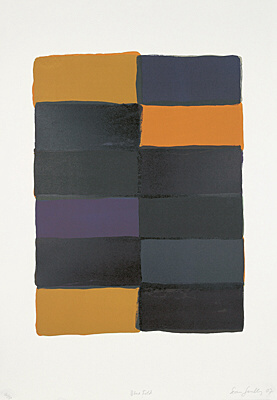 1991 Expands the use of steel, setting oil on linen Insets into large steel panels. 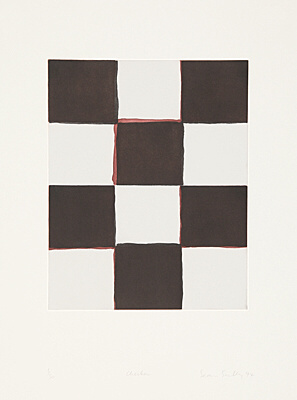 Begins regular use of the checkerboard motif, which was hinted at in the early Hidden Drawing and Taped Painting series. In December, revisits Morocco to make a film for the BBC on Matisse, who visited Morocco in 1912-13. 1993 First exhibition of The Catherine Paintings at the Modern Art Museum of Fort Worth, Fort Worth, TX. 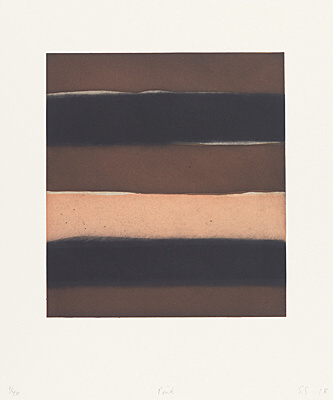 1994 Makes first paintings at his new studio in Barcelona. 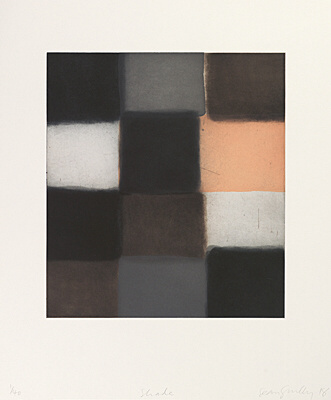 1995 Participates in the Joseph Beuys Lectures 1995 on the state of contemporary art in Britain, Europe and the United States at the Ruskin School of Drawing and Fine Art, Oxford University, England. Starts making three-dimensional Floating Paintings. These are rectangular vertical sheet metal boxes attached to the wall along one of the narrowest sides. The other sides are covered by painted vertical stripes. 1996 Visits Morocco. The portfolio Atlas Walls, 1998 includes several photos from this trip. 1997 Photographs exhibited for the first time at Sala de Exposiciones Rekalde, Bilbao, Spain. 1998 Participates in a colloquium held in conjunction with the exhibition Richard Pousette-Dart (1916-1992), Metropolitan Museum of Art, New York. 1999 Visits Santo Domingo, Dominican Republic. The portfolio Santo Domingo for Nené consists of photos taken during this trip. 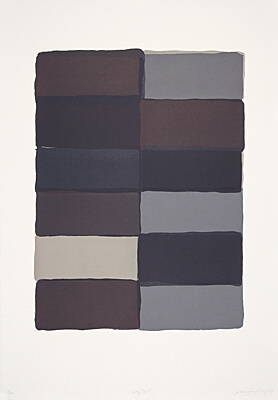 Paints Chelsea Wall, the first painting in the new studio in Chelsea, New York City. 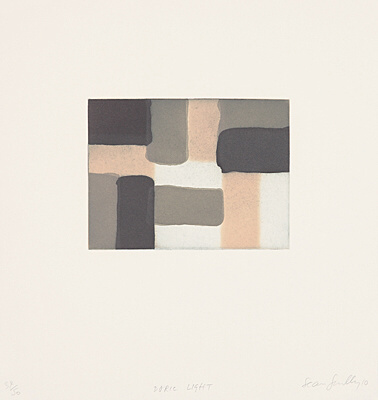 2000 Becomes an Honorary Fellow of the London Institute of Arts and Letters. 2001 Becomes a member of Aosdána, an Irish affiliation of artists engaged in literature, music and the visual arts. 2002-07 Professor of painting at Akademie der Bildenden Künste, Munich, Germany. 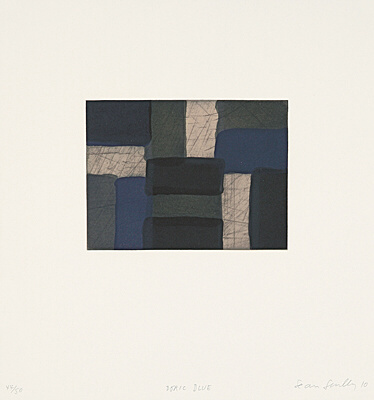 2004 Retrospective exhibition opens at Sara Hilden Art Museum Tampere, Finland; Travels to Klassik Stiftung Weimar, Weimar and National Gallery of Australia, Canberra. 2006 Marries artist Liliane Tomasko. 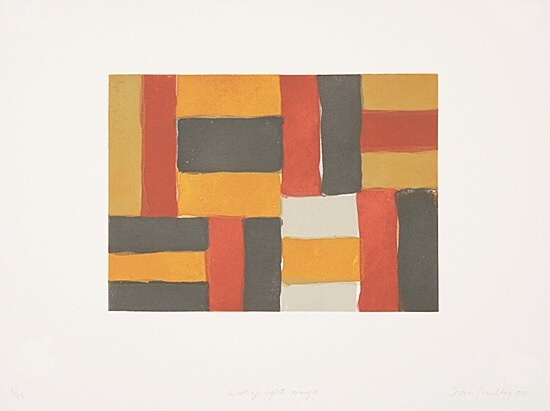 Dublin City Gallery – The Hugh Lane, Dublin opens the Sean Scully Gallery, a dedicated, permanent installation of paintings by the artist. 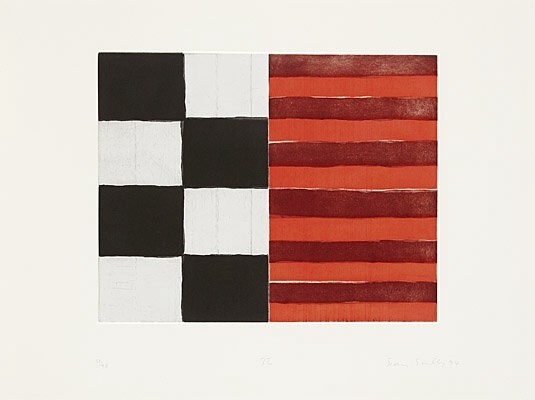 2007-08 Sean Scully. 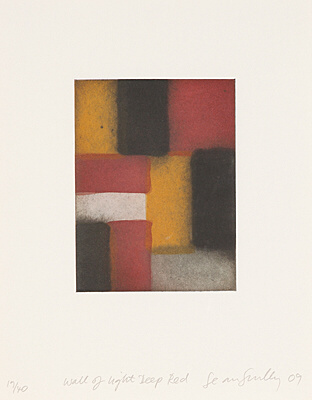 A Retrospective opens at Miro Foundation, Barcelona; Travels to Musée d’Art Moderne, Sainte-Etienne and Museo d’Arte Contemporanea Roma (MACRO), Rome. Awarded Honorary Degree of Doctor Honoris Causa by Universitas Miguel Hernandez, Valencia. Gives Elson Lecture at the National Gallery of Art, Washington, D.C.
2009 Retrospective exhibition Konstantinopel oder die versteckte Sinnlichkeit. 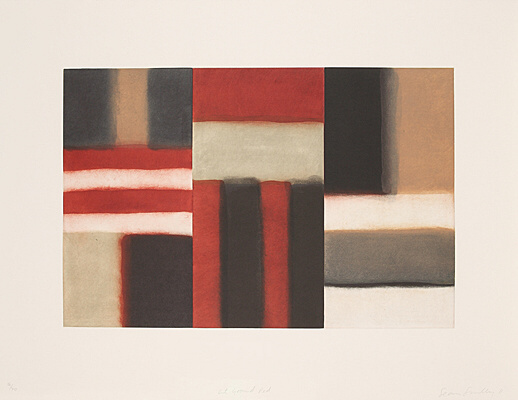 Die Bilderwelt von Sean Scully (Constantinople or the Sensual Concealed. 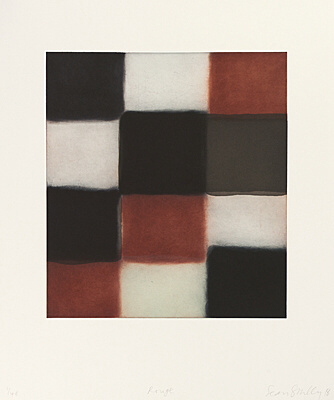 The Imagery of Sean Scully) opens at MKM Museum Küppersmühle für Moderne Kunst, Duisburg; Travels to Ulster Museum, Belfast. 2010-2011 Exhibition of important early works, Works from the 1980s opens at VISUAL – Centre for Contemporary Art, Carlow; Travels to Leeds Art Gallery, Leeds and Wilhelm-Hack Museum, Ludwigshafen am Rhein, Germany. 2011 Chazen Museum of Art, Madison, WI opens their new expansion with solo exhibition of Sean’s 8 part Liliane paintings and related works. 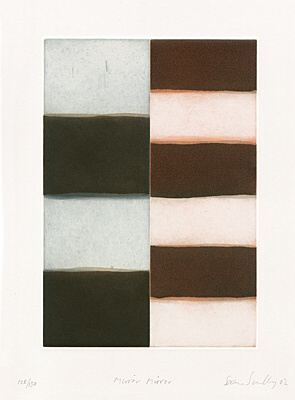 2012 Opens nine solo museum exhibitions from Philadelphia, PA to Rome, Italy, including Sean Scully. 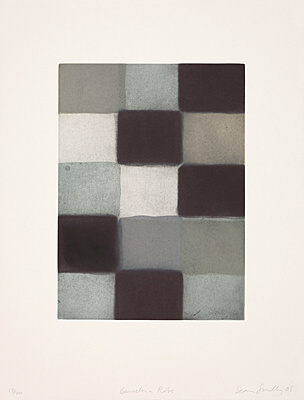 Grey Wolf – A Retrospective at the Kunstmuseum Bern, Switzerland and Lentos Kunstmuseum, Linz, Austria. 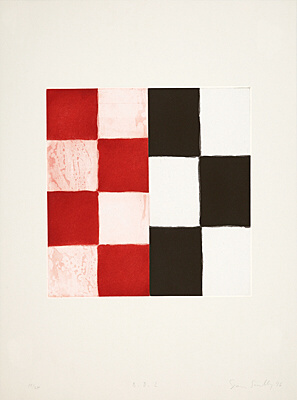 2014 Awarded an honorary doctorate of Fine Arts from the National University of Ireland's Burren College of Art. His painting Green Robe Figure, 2005 is included in the exhibition Post-Picasso. Reaccion Contemporaneas at the Picasso Museum in Barcelona. The exhibition examines the responses of contemporary artists to the life and work of Pablo Picasso. Sean extends his series Landline paintings started in 2000. A majority of the work is done on aluminum panels, composed of horizontal stripes using colors that reference his student period. 2014-2015 Opens fourteen solo exhibitions around the World, including the first major retrospective by a western artist in China. The retrospective show travels both to Shanghai and Beijing. 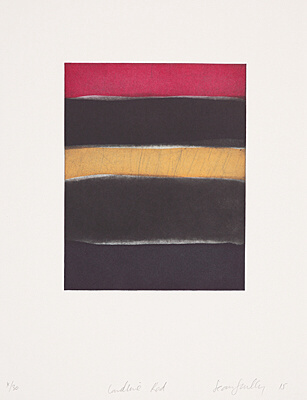 Museum Liaunig/Neuhaus in Austria opens their new building expansion with a solo exhibition Sean Scully. Painting as an Imaginative World Appropriation. Participates for the first time at the Venice Biennale with the solo exhibition Land Sea at the Palazzo Falier in Venice, Italy. Opens a new studio space in Tappan, New York. 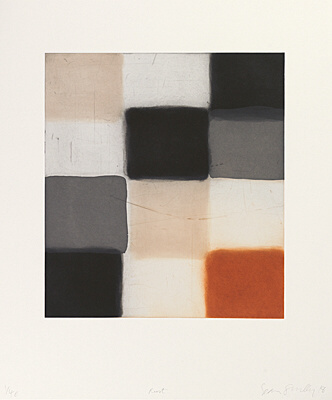 Publishes a new book of essays by Arthur C. Danto on Sean Scully. His permanent installation at the 10th century Church of Santa Cecília de Montserrat in Barcelona, Spain opens to the public. He is awarded the V Congreso Asociacion Protecturi, Madrid, Spain for his contribution to the Spanish religious heritage. A new sculpture in corten-steel Boxes of Air is made. Five more sculptures are produced, further developing this expression in depth. 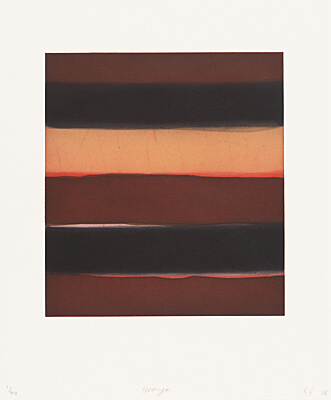 2016-2017 Second major exhibition in China Sean Scully: Resistance and Persistence. Paintings 1967-2015. London and New York travels from the Art Museum of the Nanjing University of the Arts to the Guangdong Museum of Art, Guangzhou, and the Hubei Museum of Art, Wuhan. Solo museum exhibitions are held in Budweis, Czech Republic and Valencia, Spain. Revisits the techniques first introduced in the late sixties with spray painting. Receives Honorary GAC Award by the Banco Sabadell Foundation, Barcelona, Spain. Awarded Harper's Bazaar Art International Artist of the Year Award, Hong Kong, China. Work expands in two particular directions: sculpture and figuration. Most recently Scully has revisited his early exploration in figuration from the late Sixties in an ambitious painting series of graphic yet tender figuration, inspired by his son, titled Eleuthera. 2018 Awarded Honorary Degree of Doctor of Letters by Newcastle University, Newcastle, England. Currently lives and works in New York and in the Bavarian countryside south of Munich. 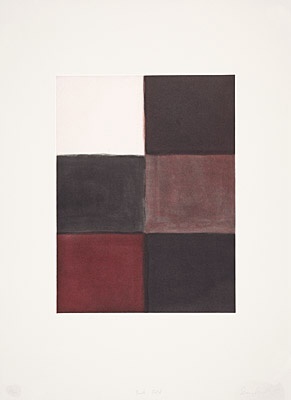 Sean Scully, 1945 in Dublin geboren, hat ein unverwechselbares und absolut zeitlos anmutendes Œuvre geschaffen. Seit den 1960er Jahren hat er die Abstraktion neu interpretiert: nicht als rein formale Auseinandersetzung mit Farbe, Form, Fläche, Struktur, Körper und Licht, sondern als Medium, dessen Ausdrucksmittel sich sowohl an äußere Stimmungen, an literarische Einflüsse und Beziehungen orientiert. Während er in seinen frühen Arbeiten seine Ränder im Sinne des damals angesagten hard edge-Stils mit Klebebändern präzise setzt, verschwimmen die klaren "Grenzen" mehr und mehr, werden in Nuancen verwischt, lösen sich aber nicht ganz auf. Die malerische Qualität, der eigentümliche Kontrast des sparsamen formalen Bildaufbaus, die Schlichtheit und der Zusammenklang von Farbstimmungen und Formen faszinieren gleichermaßen. Die Druckgraphik bietet ihm eine Vielfalt an Techniken und Ausdrucksmöglichkeiten. Er lässt sich von der Einzigartigkeit der Materialien inspirieren und findet für jede graphische Technik eine eigene Ausdrucksform. Seine druckgraphischen Arbeiten sind Meisterwerke zeitgenössischer Graphik. Faszinierende Variationen und Kombinationen vertikaler und horizontaler Farbbahnen oder rechteckiger Farbfelder haben ein außergewöhnliches und einzigartiges Werk von großer sinnlicher Kraft entstehen lassen.